Pomegranate Artbooks 1992, p. 33. 'As the final perspective of a series promoting "The Cortille"the top floor of a courthouse where judges withdrawit is a surreal depiction of the building. 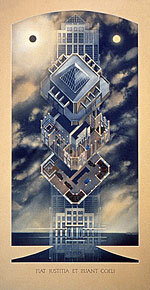 "The Cortille" is shown in plan and axonometric, superimposed over the elevation. These three central elements combine to form the pyramid on top. Based on the theme of justicewith a formal, columnar effectthe pyramid forms the fulcrum for the scales of justice in silhouette. The Latin translates: "Justice reigns though the Heavens Fall". The judicial system will always be there; the building will also as a solid element, though the "heavens" are falling through it.